I got idea for this thread from the thread about the size restriction on the width of the TV relative to the width of the stand. We had ours professionally installed as we are in the process of making our house more enjoyable and wanted to get a really nice looking result and I am not, by any means, a craftsman. I understand all the technical fine points and procedures but am not capable of doing them. I certainly can appreciate craftsmanship when I see it. We had a smallish CRT TV and a standard definition DirecTV satellite receiver with Tivo before. Due to my difficulty in learning new things we went with the same receiver only in high def. We are going to repaint the whole first floor walls and ceiling, got a rug for the room the TV is in for sound improvement, and are about to get a whole house generator. We want to really enjoy staying home together with all the fancy stuff we formally went without. We also had 16 "iffy" trees near our house and barn cut down. Everytime there is any large amount of wind, ice, or snow we get all worried. Now we will be ready for a blackout during a snowstorm this winter! Not professionally installed . The placement of the speakers is far from ideal but we make do (the system was setup nicely when we lived in our house but space and other restrictions in our current rental apartment force us to compromise). All the wires are routed behind the subwoofer so as to keep them out of view. The baskets at the bottom hide the extension cords. We got rid of our DVD player when we downsized. We now use the small and inconspicuous AppleTV on top of the cable box to stream movies from our iTunes library. The TV is on the mount that came with it. Being in California, it has earthquake strapping in the back (that came with the unit I think). The interior cabinet holds the components. There are some nifty light relays I picked up from Amazon for around $40 that allows our remotes to work from a dining table about 30 feet back. Wow. Beautiful Lsbcal Looks like a showroom! Thanks! 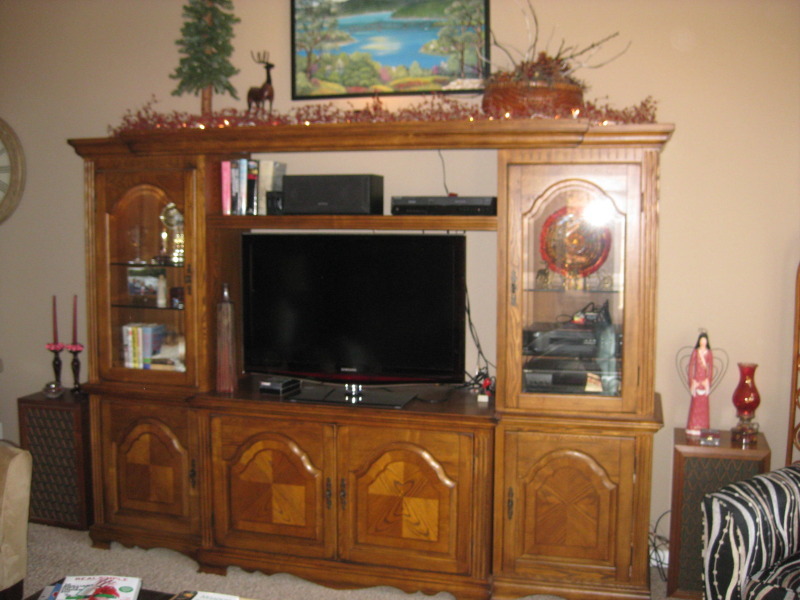 The gourd on top of the DVD (to lower right of plasma display) was done by Mrs. Lsbcal. She also did the wreath on the upper right of wall. We also had 16 "iffy" trees near our house and barn cut down. Everytime there is any large amount of wind, ice, or snow we get all worried. Now we will be ready for a blackout during a snowstorm this winter! Hurricane Katrina (2005) knocked one of my three trees onto my roof. It also weakened the my largest tree so that it finally fell down and took out my fence during Hurricane Gustav (2008). The third tree was smaller but way too close to my house for comfort. So, I had it removed. The peace of mind is worth it. Sure, I love trees, and I can go and see other peoples' trees any time I want without endangering my home. Nice TV set-ups shown, thus far! Here's mine, again. Not professionally installed, obviously; I just told the deliverymen from Best Buy to put it on the table and that was that. There is plenty of room behind the TV for wires and components, and I love the great ease of accessibility to all the wires, components, and connections, without really having to look at them on a daily basis. Ummm, OK. Looks cool and all. But what is that on the screen? Beats me... Just turned on the set, was on History channel, Pawn Stars. 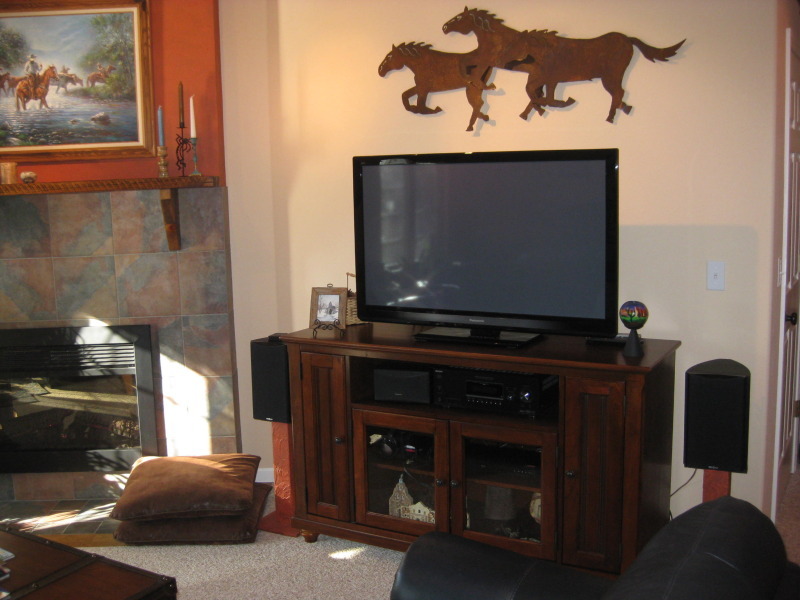 Here are pictures I posted on considering-buying-a-dlp-projector-intead-of-wall-mounted-tv. Oh Jeez. Our TV looks so small! DH has been lusting over flat screen tvs lately. The tv we have now is 57". I think a flat screen would look nicer than the 'boat' we have now; except I know we'll keep the speakers. We have six of them...DH says they're needed for his 'blow stuff up' movies. We have a 46" HDTV, which seems small when talking about 60".